This is very interesting. Several months ago I tested our infrared sauna and our entire home for electromagnetic fields. I found that the outside lights of our infrared sauna resulted in the highest readings, but I was also surprised to see that there was a lot of EMF reading in our kitchen, bedroom and living room. The sad truth is that we cannot escape EMF, it’s all around us. Most people put an electric clock next to their head in their bed. An interesting book on this topic is “Dirty Electricity”, written by Samuel Milham, MD, PHD. You can have your house inspected for EMF by a certified building biology environmental consultant. Join in and write your own page! It's easy to do. How? 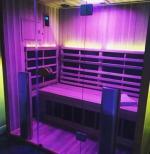 Simply click here to return to EMF in an Infrared Sauna.